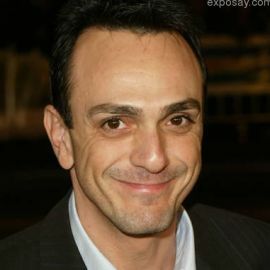 Hank Azaria attended Tufts University in Medford, Massachusetts, from 1981-1985, but did not receive his B.A. until he completed two courses in L.A. in 1987. Hank Azaria was given Tufts' Light on the Hill Award in 1999. Azaria, who trained at the American Academy of Dramatic Arts in New York, is a master of film, stage, and screen. He's appeared in numerous TV shows, including Herman's Head, Friends, and Mad About You as well as movies like America's Sweethearts and Mystery, Alaska. He was also a bartender in New York at the Arcadia, which may have helped him prepare for his most notable role as Moe Szyslak, on Fox's The Simpsons. He voices many members of the cast, including Police Chief Wiggum, Apu, Cletus, Professor Frink, and Comic Book Guy. Azaria has had several Emmy nominations for his work, and has won 3 of them for his work on The Simpsons itself. He also won for his performance in Tuesdays With Morrie. While he's stil working on the Simpsons, Azaria has a new series he's working on, Huff, in which he plays a psychiatrist who's wide array of patients keeps him quite frustrated, along with his family. Actor Hank Azaria will be the commencement speaker for the class of 2016 at Tufts University, the school said in a statement Tuesday. Actor, Best Known for "Ferris Bueller's Day Off"